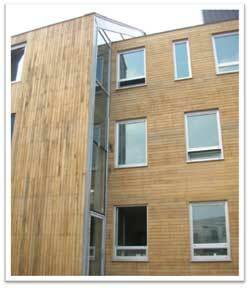 The most common form of cladding is a horizontal layout, these can be nailed with vertical battens on masonry walls or they can also be applied to timber frame. A simple overlap design can be put into place with feather or square edged wood as well rebated feather edge wood or shiplap where a flush surface is required. 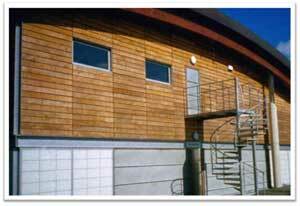 If you have a rebated profile and a limited face width then tongued and grooved wood can be used. With horizontal cladding you can have the top and bottom edges of your horizontal board chamfered to get an open joint form so that you can drain water to the outside. Due to the unpredictable manner of shrinking and minor distortion of boards that are used “green” the visual effect of the open gaps in the boards can be very useful because it creates a shadow line which conceals these changes in the wood. You need to consider in the design layout how the wood will be jointed from end to end because extra battens may be needed so that you get the required width to fix them together, a good way to work this out is to use standardised lengths rather than random ones. 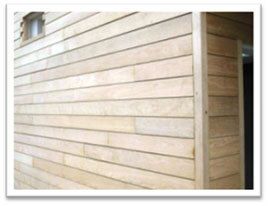 When all joint ends line up it gives a panelising effect rather than a monolithic appearance. However if a monolithic appearance is required random board widths really should be used, multiple spacing of these boards is also needed so that shorter boards can be nailed on at the end when fixing boards together.